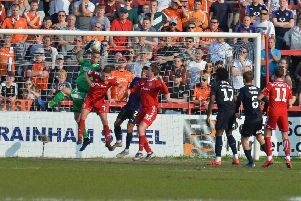 Luton boss Nathan Jones has issued a hands off warning to any clubs considering raiding Kenilworth Road for the Hatters’ increasing crop of talented youngsters. Tuesday night saw both Akin Famewo and James Justin starting for the first team against Hartlepool, with both players having come through the academy and members of the club’s all-conquering youth team from last season. We’ve shown in the last transfer window that we’re not a selling club, we’re a progressive club, we’re a club who are taking forward strides. The likes of Frankie Musonda and Tyreeq Bakinson are also both highly rated by the Hatters as well, while Town’s current youth team are impressing already this term too, with a number used in the EFL Trophy clash against Gillingham. Such success is bound to see the amount of scouts from clubs further up the Football League echelon paying a trip Luton in future weeks and months, but Jones wasn’t worried by that, pointing to the club’s policy of keeping their best players during the transfer window. He said: “They won’t be going anywhere, they’re happy here. “We’ve shown in the last transfer window that we’re not a selling club, we’re a progressive club, we’re a club who are taking forward strides. “We were taking little ones, now we’re taking bigger ones on and off the pitch, so these are all fundamental to us. “We want them to develop in our first team so they make our first team better, make our club better so that we all progress, that’s the ideal thing. “And they trust us at the minute, people like Cameron (McGeehan) and Pelly (Mpanzu) and Jack (Marriott), trust us with their development, so do the people around them. “Now the younger ones are coming through, we’re getting trusted with their development. Now we won’t abuse that, we’ll put them on the right way and it’s entirely down to them how far they go. Although Jones was quick to talk up the youngsters from almost the first day of taking charge at Luton, even he admitted to an element of surprise at just how many are coming through from the academy. He continued: “We kind of knew that we’d have two or three of them knocking on the door, but when people like Akin, who if I’m honest have gone beyond, in terms of, we might not have envisaged him being involved as quickly as possible. “But you can’t hold the boy back anymore, he’s top end. There’s others who are in the squad who we knew would supplement what we had, so we didn’t need a big, big squad, just needed to fill it with quality. Having worked with the likes of Premier League players Ryan Mason, Andros Townsend and Steven Caulker during his time at Yeovil, Jones is convinced that Town’s youngsters can make it at the top too, adding: “You can tell whether they’ve got a real chance and that’s when you invest the time in them, because you don’t know, football’s funny. “I’ve worked with some talented youngsters in my time, when I was at Yeovil, the ones we had from Tottenham, you could see were going to be Premier League players. “But you just never know, certain things come in their way, loss of form, if you do put them into first teams, they might have too much too soon. “So there’s so many variables, but these are a real grounded group and there’s a pathway here for them.